Weddings at the the Swan House in Atlanta, popular in the spring and summer, are privy to some of the most beautiful backdrops in the city. 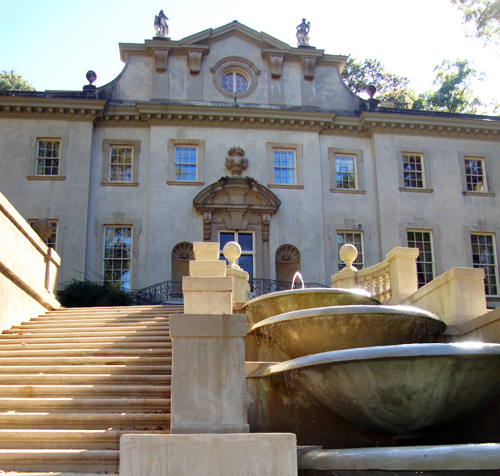 Part of the Atlanta History Center's 33-acre complex, the Swan House was completed in 1928 with architect Philip Trammell Shutze at the helm. The Swan House, and several other spaces at the Atlanta History Center, are available for weddings, as well as special and corporate events. For those who are not necessarily seeking a wedding venue or are visiting from out of town, daily tours (scheduled at admissions onsite) of the Swan House and the entire Atlanta History Center complex are available (Maybe you'll catch a glimpse of a wedding party!). This tour is one that I highly recommend, just plan ample time to explore! I just went through my old Ga Tech yearbook. We took our fraternity picture on the Swan House steps. Of course that was billions of years ago. Brides are much prettier than we were.